It’s not unusual for a piece of art to be controversial. Historically, some of the greatest artworks of all time have been. What makes Olafur Eliasson’s piece space resonates regardless of our presence (Wednesday) so unique, isn’t that it’s inherently controversial, but that to fully understand it means discovering one of the most controversial moments in scientific history. Olafur Eliasson, 2017. © Olafur Eliasson. 2017.3.16. 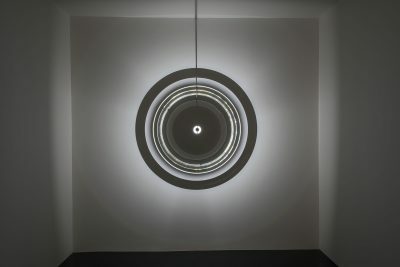 Now on display at The Corning Museum of Glass, (Wednesday) is modest in construction and comprised of just four parts – an LED light, a thin opaque disk, a prismatic glass ring, and the wall-mounted arm that connects them all. The light from the LED is blocked by the disk, and the lens magnifies the ensuing battle between light and dark onto the wall. Despite this simplicity, (Wednesday) elicits an unexpected experience in the viewer. At once awed by the beautiful, concentric rings of shadow that appear on the wall, it’s also possible to be confused by the very things that excite and stir the senses. Hidden in the simplicity is a mystery that reveals much more than meets the eye. At the heart of (Wednesday) is a story that harks back to the days of scientific discovery exemplified by the likes of Augustin-Jean Fresnel (1788-1827) and Siméon-Denis Poisson (1781-1840) — a time when great leaps in the name of innovation were made. The lure of wonder and enlightenment drove scientists and entrepreneurs onward and many of the mind’s mysteries were soon tamed. Prestige was the goal and often the result, but ridicule also lay in wait for those who stumbled. This was a time when the contested nature of light was the prized puzzle to solve. Fresnel, a French physicist, put forward the idea that light traveled in waves. This contradicted the prevailing theory of the time, preferred by Isaac Newton and staunchly defended by Poisson, that light traveled as a series of particles. In 1819, the debate was settled by a contest convened by the French Academy of Sciences. Fresnel entered his theory, which was immediately declared absurd by Poisson, a judge on the panel. To put an end to this upstart and his crazy ideas, Poisson proposed that if Fresnel were correct in his assumption, a beam of light shining directly at a spherical object would bend around the obstacle and illuminate a spot that everyone knew would surely be in shadow. Of course, this sounded illogical and preposterous! Inadvertently, however, Poisson had sealed his own fate. Having just described an experiment that could be verified, it was duly carried out and indeed the spot of light was discovered. Fresnel achieved the success that his breakthrough deserved, while Poisson only the notoriety of his name forever bound to his folly – the point of light becoming known as Poisson’s Spot. Macbeth-Evans Glass Company, Pittsburgh, Pa., about 1912. But Fresnel’s influence in creating (Wednesday) doesn’t end there. 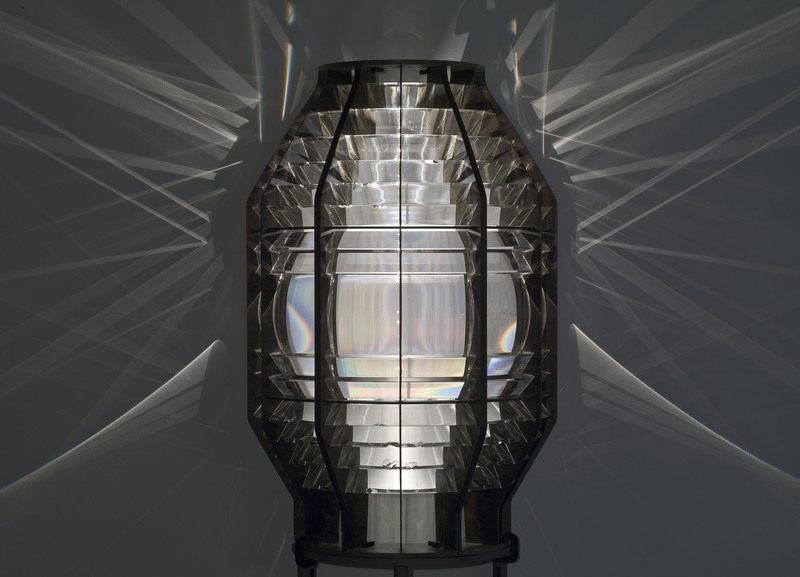 At the height of his career, Fresnel continued working with light and used glass lenses and prisms to improve lighthouses along the French coast. With a newly designed lens, Fresnel was able to better capture stray light and redirect it as a single, powerful beam of light that could be seen more than 20 miles away — a boon for sailors returning at night. Finally, Fresnel would have his name associated with his work and the Fresnel Lens went down in history. Eliasson brings this history full circle in (Wednesday) where what you see is far more than just the sum of four simple parts. It is a legacy of scientific endeavor interpreted with a contemporary eye. 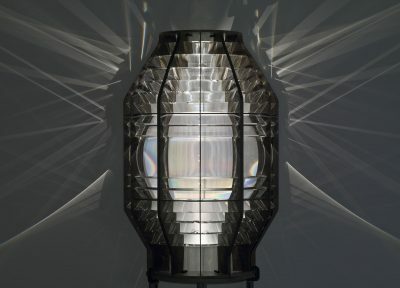 Eliasson recreates the original experiment with the addition of the Fresnel lens which helps to glorify the spot and enhance the mystery of its appearance. His method bridges the gaps between nature, technology, and art. Hi Barbara – (Wednesday) measures just under 40 inches in diameter. If you watch the video at the end of the blog post, you can get a good idea of its size as our preparators put it in place.